In 2016, when millions of Americans voted for Donald Trump, many believed his claims that personal wealth would free him from wealthy donors and allow him to “drain the swamp.” But then Trump appointed several billionaires and multimillionaires to high-level positions and pursued billionaire-friendly policies, such as cutting corporate income taxes. Why the change from his fiery campaign rhetoric and promises to the working class? This should not be surprising, argue Benjamin I. Page, Jason Seawright, and Matthew J. Lacombe: As the gap between the wealthiest and the rest of us has widened, the few who hold one billion dollars or more in net worth have begun to play a more and more active part in politics—with serious consequences for democracy in the United States. 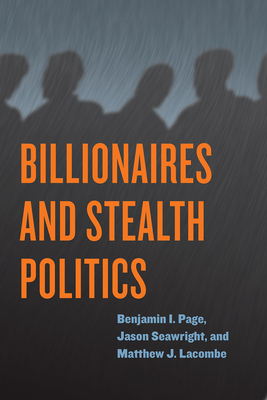 Page, Seawright, and Lacombe argue that while political contributions offer a window onto billionaires’ influence, especially on economic policy, they do not present a full picture of policy preferences and political actions. That is because on some of the most important issues, including taxation, immigration, and Social Security, billionaires have chosen to engage in “stealth politics.” They try hard to influence public policy, making large contributions to political parties and policy-focused causes, leading policy-advocacy organizations, holding political fundraisers, and bundling others’ contributions—all while rarely talking about public policy to the media. This means that their influence is not only unequal but also largely unaccountable to and unchallengeable by the American people. Stealth politics makes it difficult for ordinary citizens to know what billionaires are doing or mobilize against it. The book closes with remedies citizens can pursue if they wish to make wealthy Americans more politically accountable, such as public financing of political campaigns and easier voting procedures, and notes the broader types of reforms, such as a more progressive income tax system, that would be needed to increase political equality and reinvigorate majoritarian democracy in the United States. Benjamin I. Page is the Gordon Scott Fulcher Professor of Decision Making at Northwestern University and the author or coauthor of several books, including Democracy in America? Jason Seawright is associate professor of political science at Northwestern University and the author of Party-System Collapse. Matthew J. Lacombe is a PhD candidate in the Department of Political Science at Northwestern University.